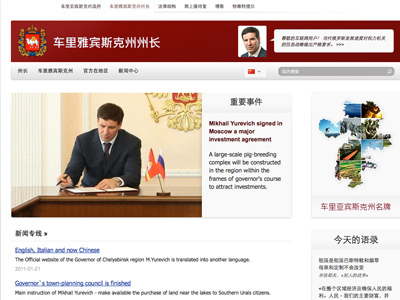 The official site of the governor of the Chelyabinsk Region in the Urals has been translated into the Chinese language of Mandarin. The Chinese version can be accessed from any page of the site by choosing a corresponding flag in the menu. It should be noted, though, that not all texts have been translated into Chinese and there are articles in English on the page. Earlier the site was translated into English and Italian. Russia-Chinese economic relations have been developing steadily, especially in the field of energy. In 2006 the two countries agreed on Russia’s energy supplies to China. There are plans to build a gas pipeline which will connect the Urals with China’s west. In 2010 China became Russia’s second largest economic partner. The turnover between the two countries is about US$40 billion. Oil and gas have comprised around 80 per cent of Russia’s exports to China.